Novosibirsk-based MRO provider Sibir Technics (part of Engineering Holding) has redelivered several Embraer E170 aircraft to S7 Airlines after performing A-checks on them. Engineering does not rule out entering the MRO market for the E170’s larger sibling, the E190/195, in the future. 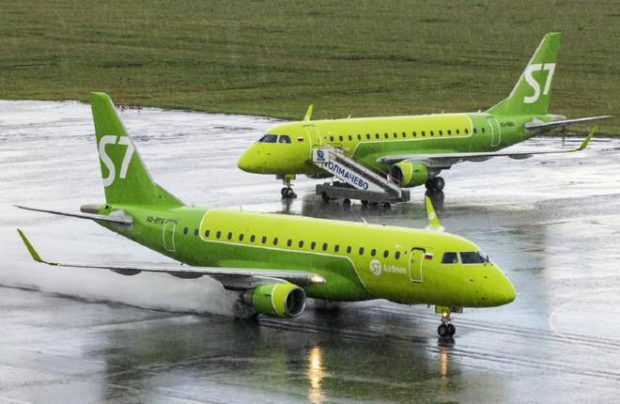 Sibir Technics completed its first E170 A-check on the aircraft with registration code VQ-BBO on August 10, slightly over 100 days since S7 Airlines had become the first Russian carrier to introduce the type in April. The interval between A-checks for this type is 750 flight hours, meaning that the Russian operator S7 Airlines must be flying its Embraers at between 200 and 300 hours per airframe every month. This is a sound performance figure for a regional aircraft. Engineering said in a statement that, due to intensive operations, the interval between A-checks on S7’s E170s does not exceed three months. To ensure that the maintenance works do not interfere with the flight schedule, the first A-checks were carried out during the nighttime. Several aircraft have already been redilivered to the operator. S7 currently has seven of the type, and expects to bring the figure up to 17 eventually. The Embraer E170 is Engineering’s seventh type. Its other subsidiary, S7 Engineering with maintenance bases at Domodedovo and Mineralnye Vody, is also approved for E170 maintenance, but has not performed any A-checks on the model yet. Speaking to Russian Aviation Insider, Engineering’s Planning and Sales Director Igor Panshin said that Embraer maintenance is one of the provider’s promising development niches, but that “it is still too early to say that it is a priority one.” Panshin noted that the company is considering obtaining clearance to provide services on the Embraer E190/195, because chances are scarce that the fleet of the smaller E175s will continue growing in Russia outside of S7 Airlines’ plans. There are currently eight E170/175/190/195 operators in Russia and neighboring countries. These are Air Astana (nine E190s), AZAL (one E170 and four E190s), Buta Airways (two E190s), Air Moldova (three E195s), Belavia (two E175s and two E195s, with more planned deliveries announced), Ukraine International Airlines (five E190s), Georgian Airways (two E190s), and Russian regional operator Saratov Airlines (two E195s with plans for another two). Other carriers, including Pegas Fly and UVT Aero, have expressed their interest in the E-Jet family, so the regional Embraer fleet may yet grow.